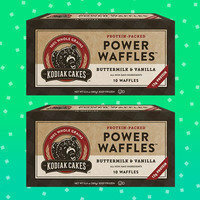 We love Kodiak Cakes' protein-packed mixes, so we're thrilled to welcome these heat 'n eat waffles to the table! There are other varieties in the lineup, but this one packs the most protein. The serving size is for two hearty waffles; a single one has just 130 calories and a whole 6 grams of protein. Track down a box in the freezer aisle, and cue the light syrup! If you're anything like us, you crave chips dipped in zesty cheese sauce, but you know that's not exactly a healthy snack. 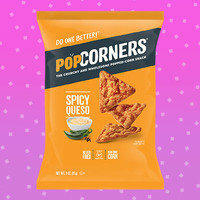 Luckily, PopCorners has coated its perfectly crunchy popped-corn chips in rich queso flavor. It tastes like the lovechild of Doritos and movie theater popcorn! Not into spicy snacks? Check out the rest of the tasty lineup. Head to your local grocery store, and pick up a bag or two for your snacking pleasure… The Spicy Queso flavor is rolling out now! 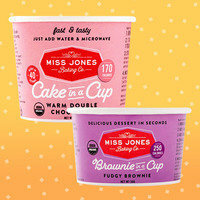 Several brands recently launched microwavable dessert cups, but some have 400+ calories! Not these organic sweets. Choose from several Cake varieties (Vanilla, Chocolate Chip, Warm Double Chocolate, and Confetti Pop), plus Gooey Chocolate Chip Cookie and Fudgy Brownie. Just add water (plus some oil for the brownie and cookie). Then stir and nuke, and you'll have a single-serve treat in about a minute! Find a store or order online. March is National Frozen Food Month! A perfect excuse to seek out those new pints of ENLIGHTENED Ice Cream, no? Share these rockin' treats with all your buds! Click “Send to a Friend” STAT.